Manufacturing of parts through drilling, machining, forging, stamping or molding often results in sharp raised edges, seams or burrs on the part that can interfere with its functioning and safety. Accidents, injuries or major production delays can all result from a small notch or defect on the surface of a part. In order for a part to be most effective in terms of operation, aesthetics, function and quality, the burrs must be taken off. Through the process of buffing, polishing or vibratory finishing in a deburring machine, burrs or imperfections on the surface of a part or component can be removed. Deburring machines can be simple, hand-held tools to work with smaller, more fragile pieces of equipment, or they can be large automated systems with wheels, belts and vibratory tools. 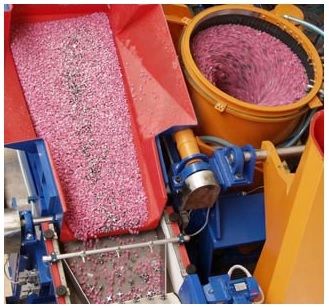 A vibratory tumbler is an example of a common deburring machine in which the parts are placed in the tumbler, or sealed drum, with deburring media such as ceramics, glass or the more natural corn cob media. The barrel agitates the parts and deburring media with a side-to-side vibratory motion, causing friction and grinding. This movement polishes the parts and removes unwanted surface burrs. Vibratory finishers are similar to tumblers but are more complex and typically include conveyor systems and vibrating sections. Deburring media and tumbling media are chosen depending on the type of machine used, and the type of part needing deburring. Common materials include ceramics, synthetic plastics and organic compounds such as corn cob and walnut shells. Particle size and hardness play an important role in the process and so must be considered carefully. Wet media is sometimes used to add a protective coating for the parts, or to add a coloring agent. Some automated deburring machinery uses robotic technology for precision deburring and polishing, especially for parts such as gears or engine components. Larger unfinished parts maybe require a deburring machine such as a cabinet or benchtop polisher. There are many different uses for deburring machines, but industrial applications include finishing molds and dies, cleaning components for pharmaceutical or chemical components, aerospace and automotive parts etc. In these industries, it is important that a smooth surface is achieved to prevent possible areas of stress and weakness, and to allow for the accurate scientific or mathematical analysis of component performance. Deburring Machines Deburring machines are used in the process of secondary machining and finishing of parts to result in a smooth surface.